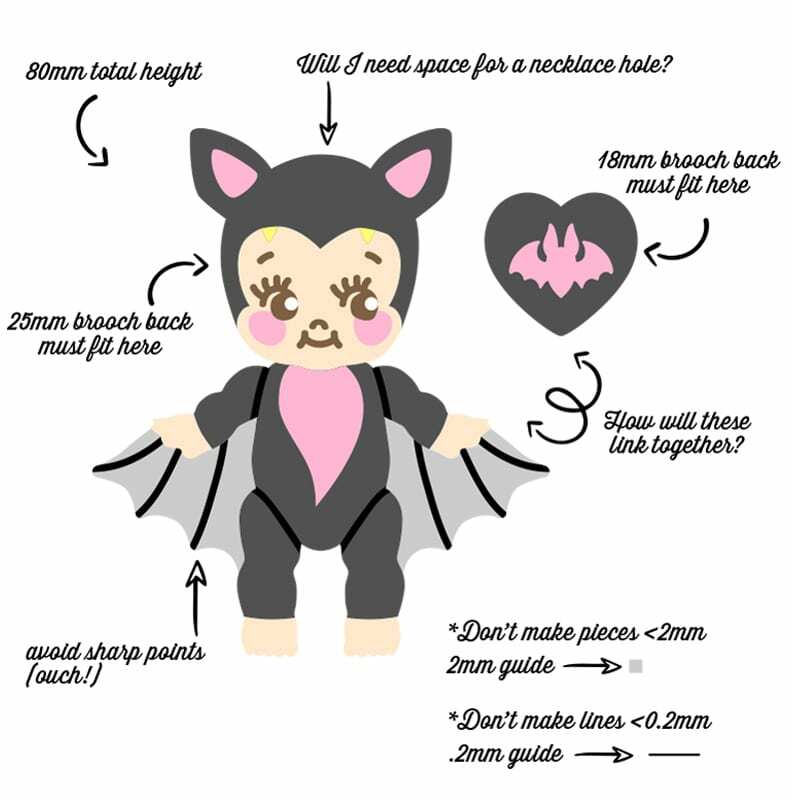 In this tutorial, Ella takes you through step-by-step how to design for creating complex, multi-layer, multi-piece jewellery designs (like the very-much-in-fashion acrylic brooches and earrings that are made with different pieces that are glued together like a small puzzle). Included along the way is advice, hints and tips for nailing your designs, as well as tips for making them good quality, wearable jewellery pieces. The end piece is a jewellery design prototype to test your design, before moving onto production stage. This tutorial is peak complexity in terms of making laser cut jewellery and is NOT recommended for beginners. This sort of design work is difficult and takes a lot of thought, patience and experience. 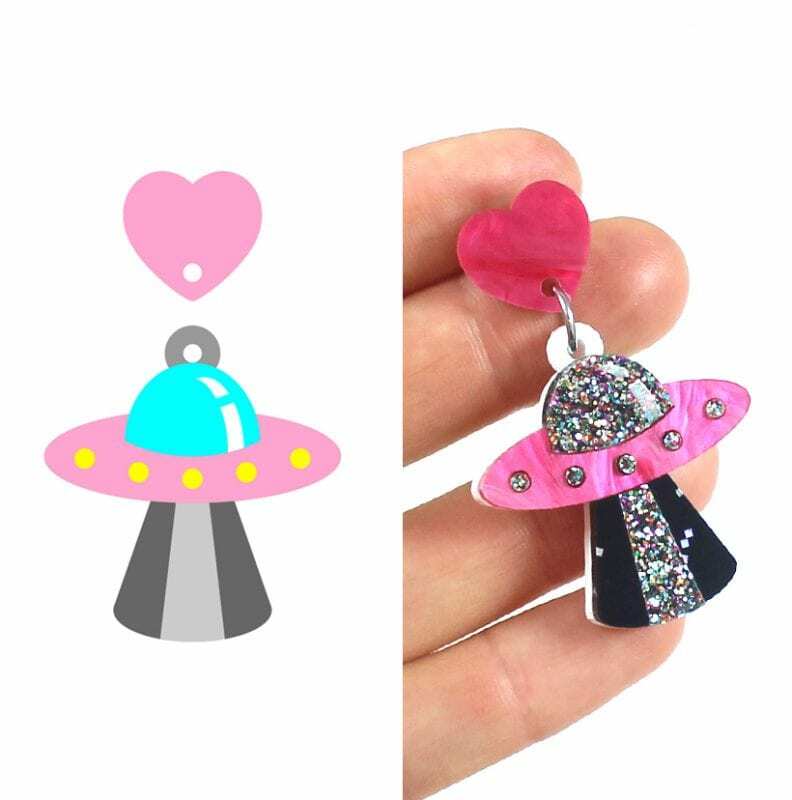 Do not underestimate the amazing level of talent that is popular on Instagram at the moment for creating jewellery designs like this. A desktop PC or Mac and a vector graphic programs like Adobe Illustrator, Corel Draw, Ink Scape. Make sure that the program you’re using can create AND export vector graphics, such as Adobe Illustrator, Corel Draw, Ink Scape, etc. Vector graphics are a type of digital file that is made with mathematical formulas (rather than pixels).  Vector is the only ‘language’ that the laser machine can follow in order to cut, as the laser head is guided by the vector points in the digital file. Making sure that the program you’re using can EXPORT vector graphics is crucial. Programs like Photoshop, Clip Studio Paint (Manga Studio), Adobe Illustrator Draw will allow you to create a ‘vector’ layer within the program, but you will NOT be able to EXPORT vectors from these pixel based programs – they will rasterise/flatten/pixelise your vectors when exported, meaning they are no longer vectors graphics. My advice: use your drawing programs and apps for drawing, and use vector graphics programs for creating vectors. Make sure you have allowed spaces for holes, room for brooch backs to fit on, etc – anything you might need to make your finished product. For me peronsally, I can’t skip this step, it’s crucial. I learn SO much from seeing things in real life, at the actual size that they’re going to be. 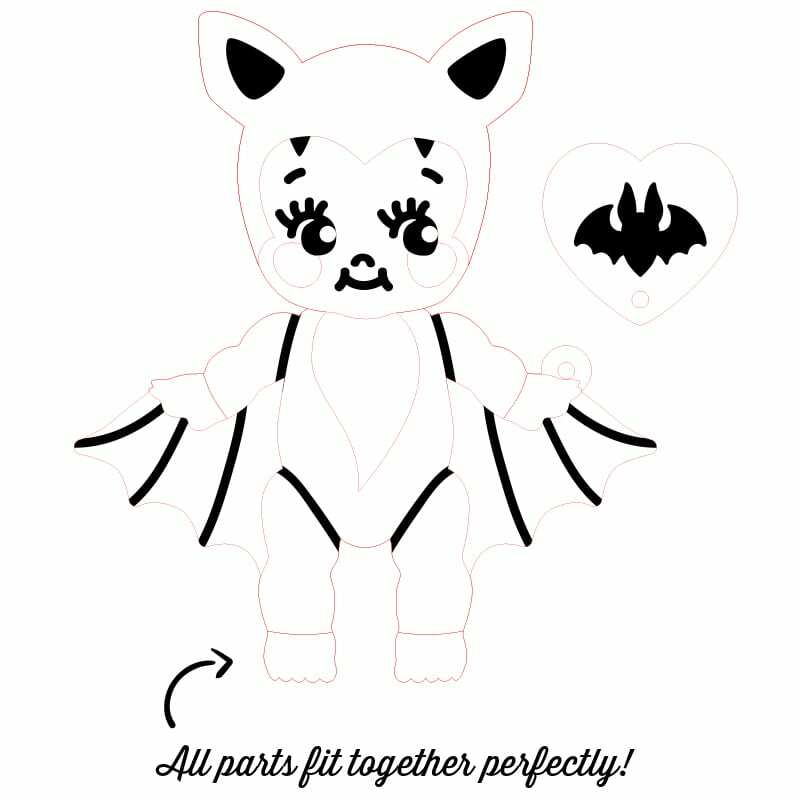 Do this: print out your drawing, roughly cut it out, and have a look – literally wear it as if it was a brooch. Once printed, you might find that your design is too detailed and needs to be larger, or that some parts are too fine and need to be thicker, or it might be just perfect! Repeat steps 2 and 3 until you’re 100% happy, and do not move onto step 4 until your design is resolved. You’ll make it difficult on yourself if you get down to step 6 or so and want to change something. I always find it helpful to take photos of my designs and look at them. 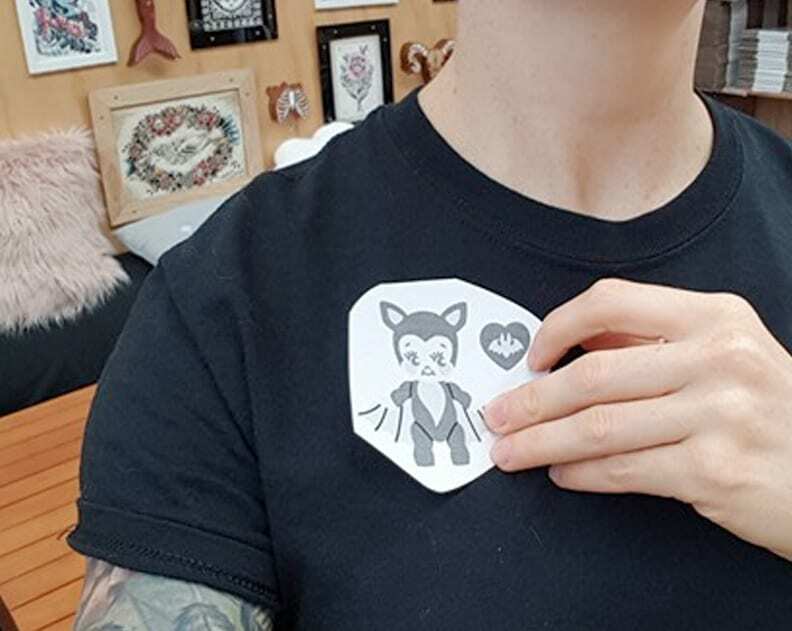 Like, pretend your finished piece is going to be part of someone’s outfit of the day post – does it look good as a wearable piece? What pieces will layer on top of other pieces? What pieces will need to fit inside other parts? Do I need to add a hole anywhere? We recommend using 2mm circles as holes (this size seems to fit most jump rings), and place them about 2mm from the material edge. Do I need a loop anywhere? We recommend making 6mm circles with 2mm circles inside as ‘loops’. Loops are a great alternative option where a hole won’t work e.g. if I used a hole (instead of a loop) on the hand of my kewpie, the link would need to go through 2 layers of acrylic and might not fit. Will any parts need engraving (to apply techniques like paint fill)? I opted to go paint fill for the face, bat wing, hat and heart details. Think about how many different materials you envision the final pieces having. 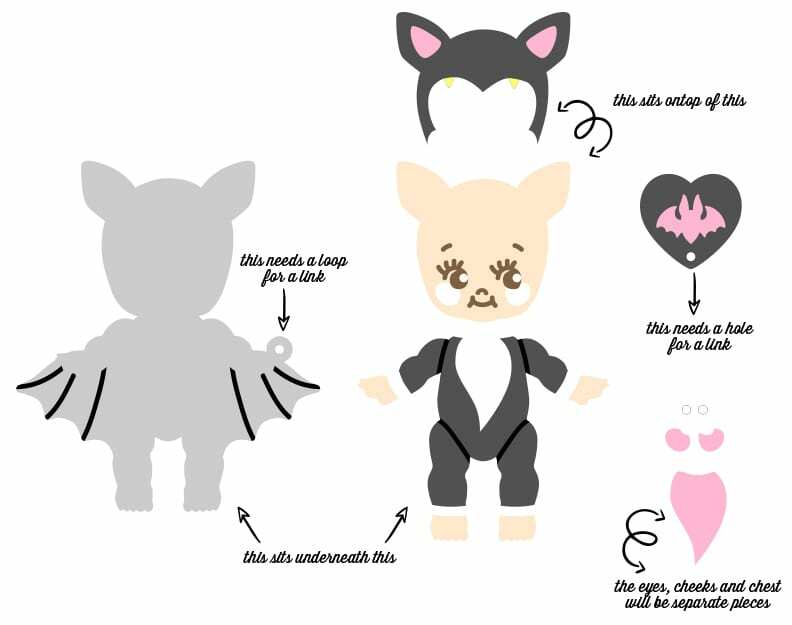 It’s cost effective to use a smaller range of materials (there is a $20 minimum per vector file/material type ordered), so can you make a few different pieces from the same material? By the end of this step, you should have all your shapes separated out as you want them to be in real life. It’s not a bad idea to print and proof your design again at this stage, just to get a sense of scale in real life. 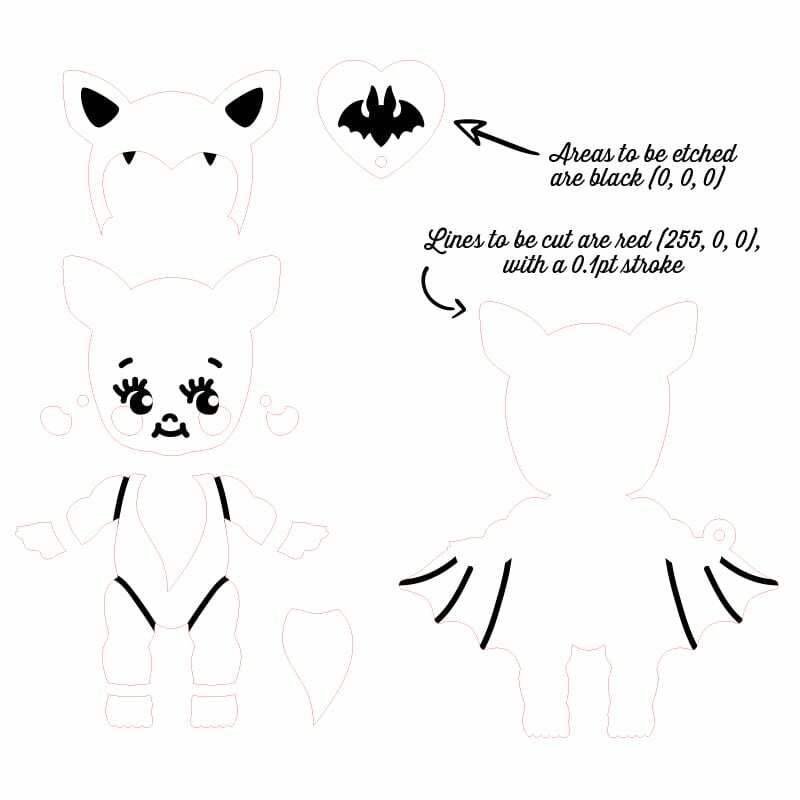 Now that you have the details of all of your pieces designed, you need to set up the shapes to be recognised by the laser software. For any lines that you would like to be cut, give them a RED 0.1pt stroke. The laser machine will only understand and cut from a vector line that is set to RGB red (which has a value of 255, 0, 0), with a 0.1pt stroke. Anything but this setting won’t be recognised by the laser software and will not cut (such as if the red is slightly different, the thickness is different, or there are any effects like opacity or shadows). 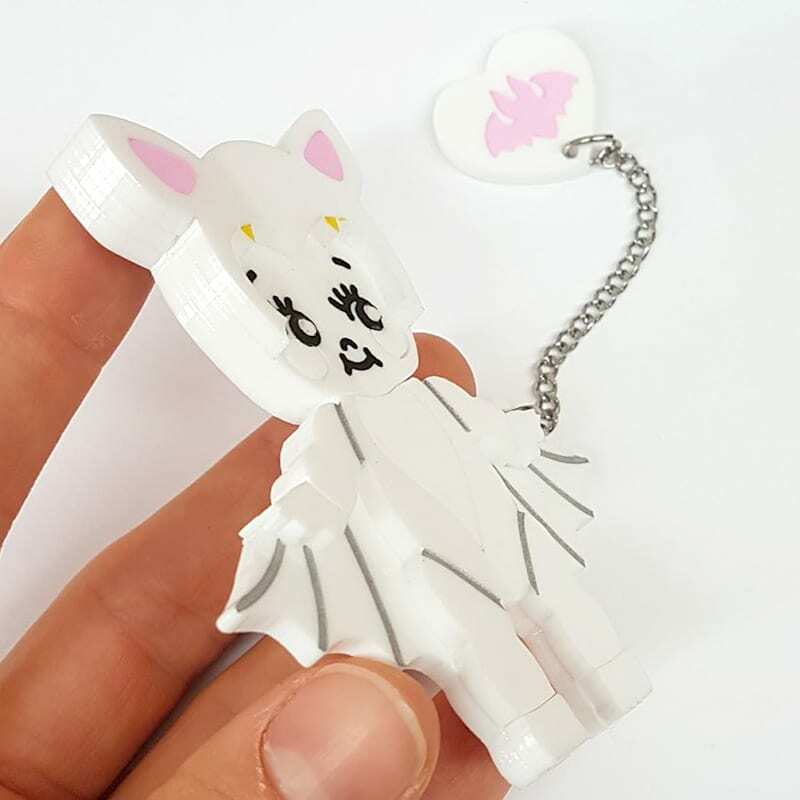 The software will also find and cut ANY lines, including duplicate lines (such as if you have accidentally placed a cut line in the same spot twice, the laser will cut that line twice and scorch the material) or hidden lines (such as if you have used a clipping mask, which hides but contains cut lines). For any areas that you would like engraved, make them BLACK (which has a value of 0, 0, 0). Engraving is different to cutting, and can be done from a stroke or fill (it does not matter, so long as it is black). Since you’ve been changing colours and moving things around, it can be a good idea to double check that everything fits back together and layers as you envision. The thickness of the laser cut line is very fine and precise, and will cut exactly how your design appears on the compute (so your shapes should fit together as perfectly as possible). Now you need to lay out your shapes to fit onto a material sheet for a quote. Because I want to make this design out of 3mm acrylic eventually, I will run a test in 3mm white acrylic. White acrylic sheets are 600mm wide by 300mm tall, so that is the size that I make my document. The maximum usable area for white acrylic is 595mm wide by 295mm high, so I make sure my shapes fit within that size. I will be charged for the total column of material used, so I try to arrange my file efficiently. Leave 1-2mm between shapes. You can see that I have added in duplicates of small pieces. Worst case scenario is that you accidentally drop or lose a small piece, and you don’t want to be one tiny piece off finishing your brooch! For the Vector Etch quote by file service, we have a minimum order of $20 per file. Because of this, it is most cost effective to run sample cuts in the same material. The cheapest materials are MDF, and black, white or clear acrylic. 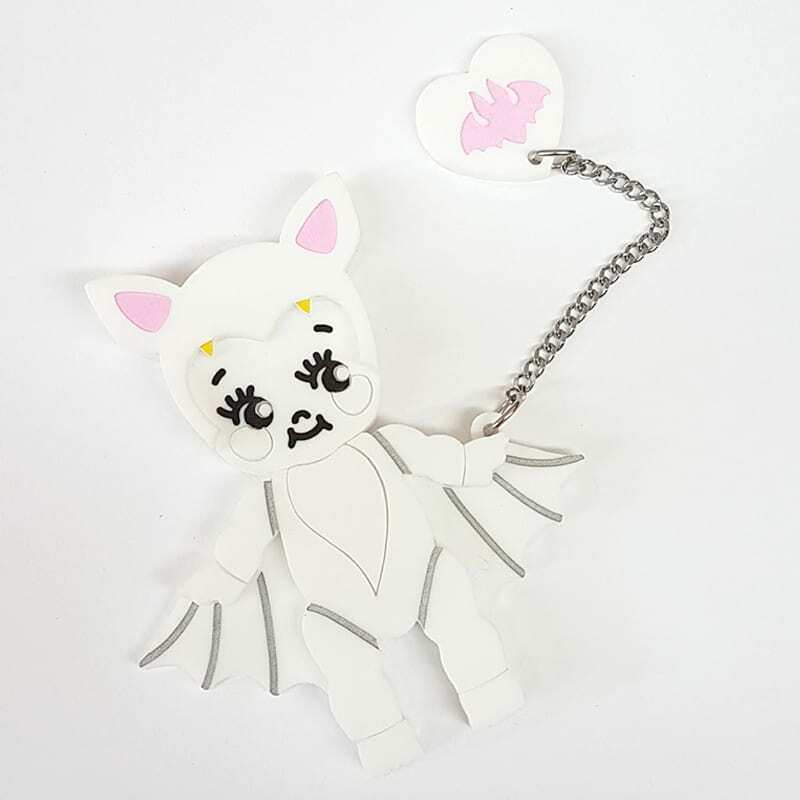 For this file, the price in 3mm white acrylic would be $23 (excluding GST and any postage costs). If I was to test this design in lots of different colours, it would cost a lot more. For example, it could be something like: $20 for a file in black acrylic, $20 for a file in cream acrylic, $20 for a file in silver acrylic, etc. Part 2 to this tutorial will focus more on hints and tips for laying out files. To be cost effective, you could also consider testing multiple designs in the same material at the same time. 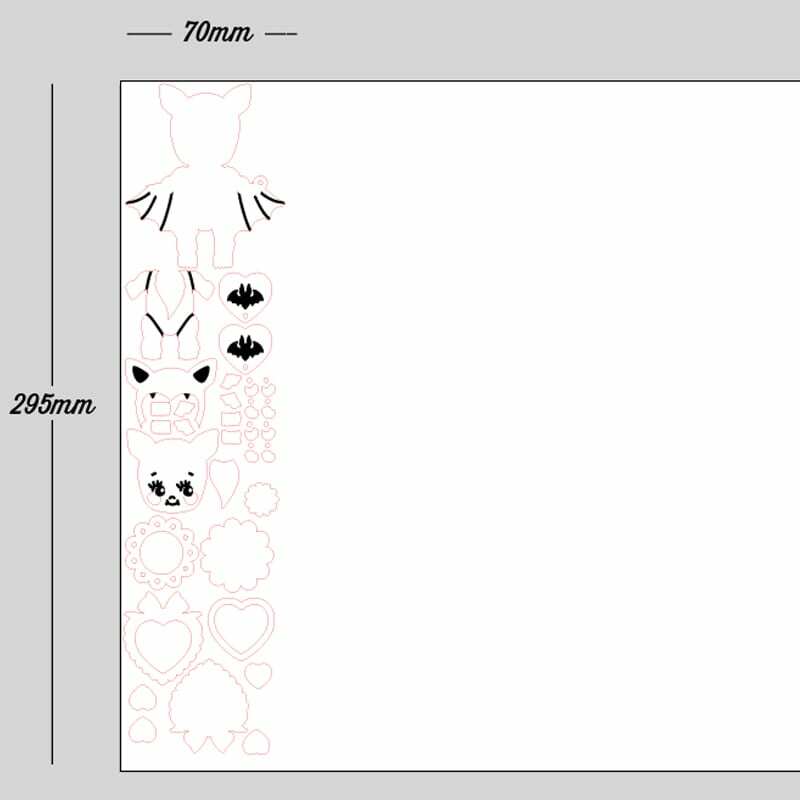 For example, in this file I added in more shapes and the price was calculated at $25 (excluding GST and any postage costs). With my shapes all arranged, I save out my final file as an .AI file (other suitable formats are .PDF, .EPS) and upload it for a quote. 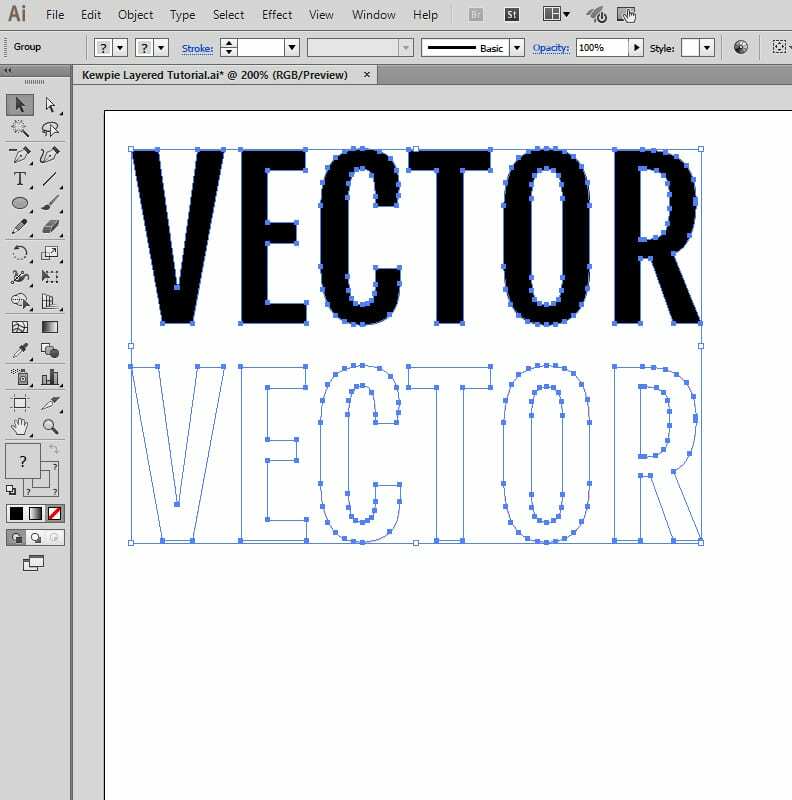 Vector Etch staff respond asap, usually within 24 hours. Once I get the quote and I am happy to go ahead I ask for an invoice When the invoice comes through, I follow the links to complete payment. My order is processed within 1-3 business days, and then posted or pickup is available for Brisbane based customers. To combine postage, after you have submitted a quote, you can checkout with material swatches of your choice to use to test colour schemes for the final jewellery design/s. 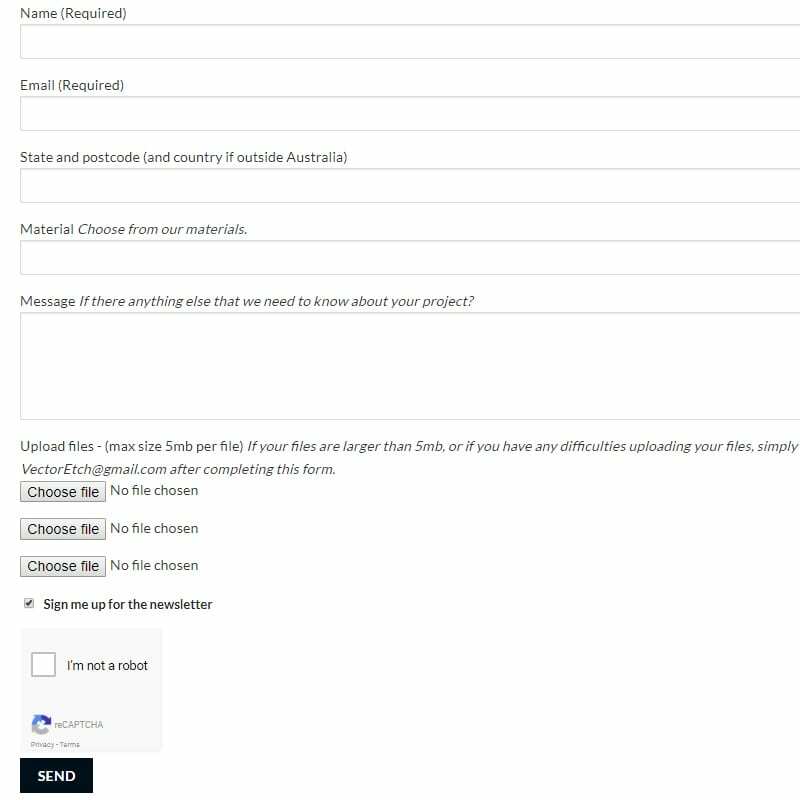 To do so, add swatches of your choice to your cart, follow the prompts to checkout, for the post method select ‘combine with previous order’, and add a note to let us know that you are combining with a quote sent earlier. When you receive your pieces, they will all have protective tape on one or both sides (most materials have tape on both the front and the tape). You can add any techniques that you like, such as paint fill, linking with chain, etc. Glue your pieces together and give it a trial! You might find that you got everything right first go and are very pleased, or you might find that you would like to make some small changes.